From the rugged sandstone cliffs of the Murray River to the maroon dirt of the Red Centre this journey highlights country Australia in it’s true form. Exclusive to Holidays of Australia & the World. Gaze upon the rugged formations cruising the Murray River. Indulge in all inclusive luxury onboard the Ghan. Tick off the must-see’s of Uluru and the Red Centre. 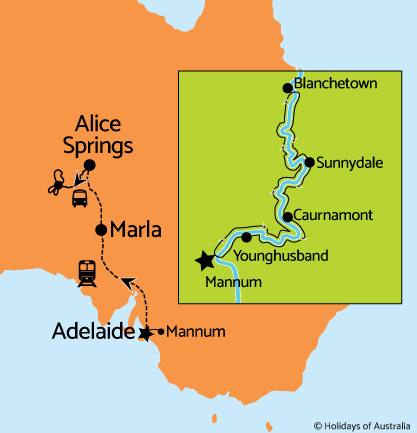 Transfer to Mannum with half day Adelaide City Sights tour. 4 night Outback Heritage cruise aboard PS Murray Princess. Your cruise includes onboard meals and sightseeing. Transfer to Adelaide with afternoon Barossa Valley tour. 1 night aboard The Ghan travelling from Adelaide to Alice Springs in Gold or Platinum Service. Includes all meals, drinks & a off train experience in Marla. Evening Field of Light experience. 1 night stay in Alice Springs at Doubletree by Hilton Alice Springs including breakfast.